Just for the record, I know “Fiesta Pocket” is sort of a lame name for this recipe, but it’s 10:41 pm and the creative juices are stagnant. If it wasn’t so late I’d call Kara for some bright ideas. Forgive me. Toss lettuce, cheese, beans, corn, jicama, and tomato in a small bowl. Set aside. Follow the directions on the ranch packet to make the dressing (you will need buttermilk and mayo which is not listed above). Stir in the cilantro and cumin. Taste the dressing and add more cilantro and or cumin if you feel. Toss the cilantro-cumin ranch with the lettuce mixture until it is evenly coated. Make sure not to over-do-it or under-do-it with the dressing, if you know what I mean. 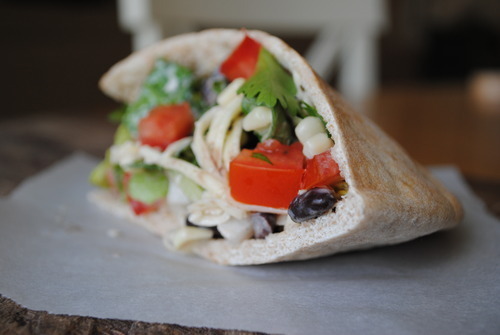 Take a pita and cut it in half. Peel each halve open and stuff with lettuce mixture. Devour. The lettuce mixture recipe will fill one pita bread pocket (two halves). Feel free to x’s it as many times as you need.